I'm at home today, waiting for the plumber to show up. This is a call-back. He came last Friday to fix a leak in our bathroom. He showed up, spent some time, then left without saying what he found, what he did, and whether he thought fixed it (he didn't because it's still leaking) He was due here at 10 A.M.; it's now 11:45 and all I know is that he's "running late". I have to find a reliable plumber. Anybody know one? Last night Janet and I went to the Pier House Piano Bar to celebrate Commissioner Clayton Lopez' birthday and to see him perform with Larry Smith. Larry is the regular entertainer there, performing several times a week, each night with a different focus. The Sunday night Showcase is a feature that he's done for several years. He showcases the talent of one person and invites other entertainers to join in for duets and trios. We sat with an acquaintance of mine, David, and his wife Jeannie, and one of the things we talked about was the precipitous decline in the quality of service that one finds in many of the businesses here. Coincidentally, I got a letter last weekend from Angie's List, an online company that collects and disseminates consumer ratings on a wide range of local businesses. Their service is only useful if they've entered a particular local market area. Key West and the Florida Keys fall into a category called Florida - Other, and there's little if any coverage that would be useful to me. In my experience, one of the best large companies operating here is Home Depot. The customer service culture there is clearly an important element of the training they give. If you catch the eye of any employee, even just passing one in the aisles, there'll be a greeting from that worker. If you look even vaguely like you're having trouble finding something, any employee will step right up to help and lead you to what you're looking for, not just wave you off in the right direction. Jeannie named off several of the businesses she uses -- doctor's, hair salon, shops -- where she is satisfied, nay, pleased with the customer service she gets. They are mainly smaller places where one-on-one is the norm. I was talking with Chris, a tenant, this morning after he walked Rommel and we were discussing these things. Chris works the late-day shift at the CVS store at the Gulf end of Duval St. and he tells me of the other side of the customer service equation. The bathrooms at CVS are open while the store is open, and they are regularly trashed and damaged to the point that they have to be closed until they can be serviced. It happened again last night, so staff put the Out of Order sign on the door. Later, some half-drunk guy came in and began swearing at Chris when he told him the bathroom was closed. 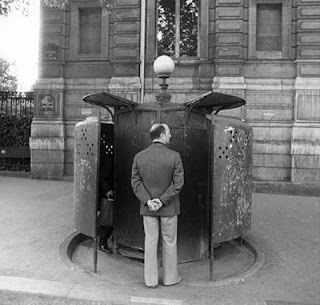 There is a scarcity of public bathrooms in the City, even in Old Town where there can be thousands of tourists milling. 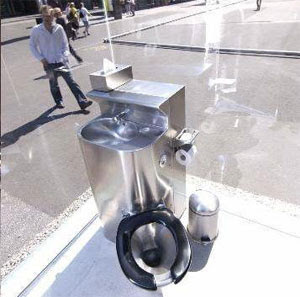 The bars and restaurants mostly restrict the use of their facilities to customers. The only public toilets are at Mallory Square, behind the Chamber of Commerce offices and I'm not even sure if they are open after the Sunset Celebration is over. 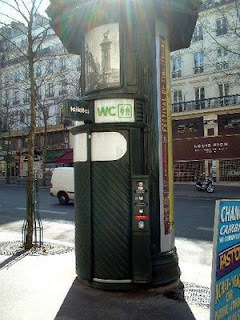 If you've ever been to Paris you will recognize this. 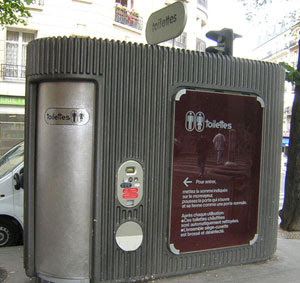 It's what the French call a pissoir, a public pay toilet located right on the sidewalk and emptying directly into a sewer. The model shown here evolved from an older style, below. I enjoy your reading and viewing your pictures and posts. Thanks, Bob! Say, what do you think about this negative article on Florida in Time magazine? I enjoy reading and viewing your pictures and posts. Give Tommy Haskins a call next time. He's been in the plumbing business for years down here. He's a great Rotarian to boot. He did the charitable work at Samuels House a few weeks ago.